Self-Paced—Students are allowed to move on when they show they mastered the material through quizzes and tests. New to Alpha Omega curriculum? Placement tests help you find the correct grade for each subject in the LIFEPAC™ program. Filling in the Gaps? One homeschool mom used these tests when she took her children out of public school to find learning gaps. Then she taught the necessary material to get them up to grade level. LIFEPAC Scope and Sequence—Learn more about this program. For example, we’ve used the Health Quest with our children. Another course we liked is the LIFEPAC Civics. Another nice feature of the LIFEPACs is that they are “grandparent” friendly. When their Grandma visits, she offers to help the boys with their homeschooling. She loves working with the boys on their LIFEPACs! It is easy for her to figure out what they need to do next without asking me or reading a teacher’s manual. 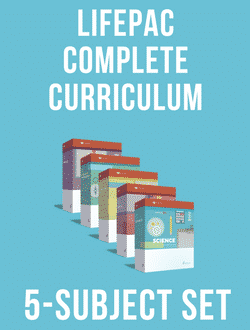 LifePac Science Experiments DVDs are available for Lifepac Science Grades 4-10.